Flensburg: 23 May, 1945. The war in the European theater was officially over. Hitler and Goebbels, along with many of his followers were dead. After signing the agreement of unconditional surrender of the German armies in northwestern Europe to British Field General Sir Bernard Law Montgomery near Hamburg on May 4th and Nazi Colonel General Alfred Jodl agreed to unconditional surrender to US General Dwight Eisenhower three days later at Rheims (France), millions of Europeans celebrated V-E Day, as Nazi Germany became no more. On this day, 70 years ago, the last pocket of the Nazi government surrendered to British forces stationed in Flensburg, Germany. Jack Churcher had installed his post in the southern part of the city center at Norderhofendem 1, and British troops had taken control of the northernmost city in Germany. In comparison to other cities, Flensburg sustained minimal damage, and much of the city’s population was well-fed and dressed. They were for the most part aware that the war was coming to an end, and according to historian, Gerhard Paul in an interview with the SHZ Newspaper Group, “It was a matter of time before this absurd came to an end.” With the British troops entering Flensburg, the Nazi era had come to an end. All except for the suburb of Mürwik, located on the eastern end of the harbor. 1. Why did Dönitz and his government wait for so long until they were discovered by British troops and were arrested? Could they not have surrendered to Churcher? 2. As Dönitz claimed to have power in Germany, even after the agreements were signed and the war ended, would it not have made sense to declare 23 May as V-E Day and the end of Nazi Germany instead of May 8th? Perhaps these questions will be speculated for a long time and may never be answered, but for Albert Speer, the architect of Hitler’s who received 20 years of prison time, “Flensburg was considered only the stage for the Third Reich, but nothing more than that.” But why the town of Flensburg, of all the places Dönitz could have chosen? Was it an escape route for him and his people to flee the country through Denmark and the seas? Were there that many people sympathizing with the Third Reich, even though numbers indicate much lower support? Was it because of the navy, the rum, the beer? We may never know…. 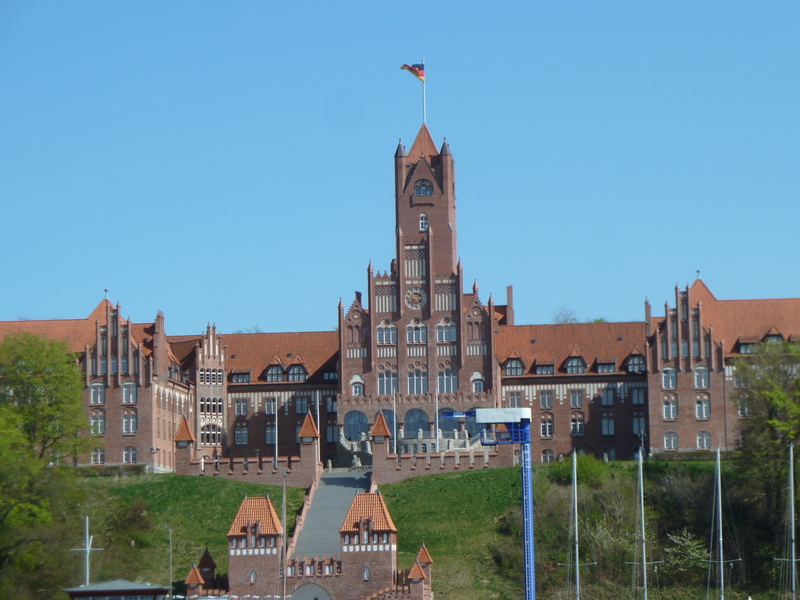 Today, Flensburg is a thriving city with many multi-cultural aspects. It still has the largest number of Danish people living there, along with many from other countries, even some from the US, Britain and Russia. The Naval Academy is still in business, and the city prides itself with its handball team, rum, beer, and other northern delecacies. But this 70-year old scar still remains, even if the city survived almost entirely unscathed by the war. Time always has a way of healing, yet memories still remain, even on this day, when Dönitz and his men were arrested for their crimes, of holding the city (and in particular, one of the suburbs) hostage despite the war being over, and were brought to justice. This, in my eyes, was the real end of the European theater of World War II, and with that, a chapter in history we must never repeat again, period. Note: Check out this documentary on the Flensburg Fiasco in German, as reported by SHZ, here. It was the last of the series written on the 70th anniversary of the End of World War II. A guide to earlier articles you find on the SHZ web, here. That I really don’t know, but I could ask around as I have some connections up there. I know the last remaining Nazi soldiers were arrested and taken into custody in 1945, many of them were extradited to Nuremberg for the trials a year later. Other than that, I’d have to check it out…..